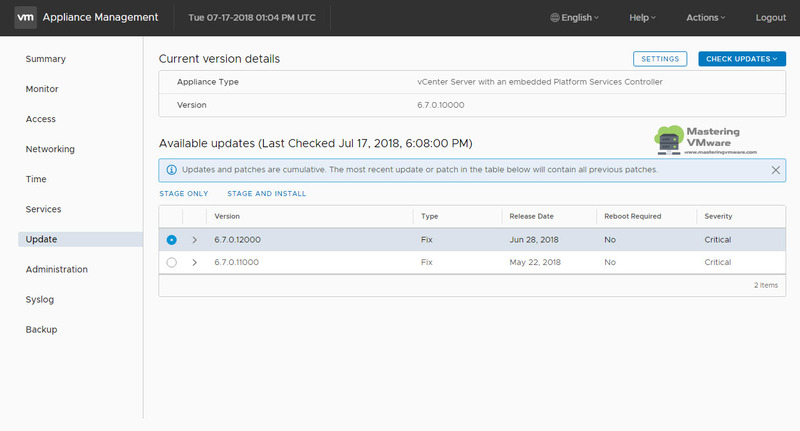 vSphere 6.7 comes with the newly improved HTML5 based client which provides rich user experience and many more features. 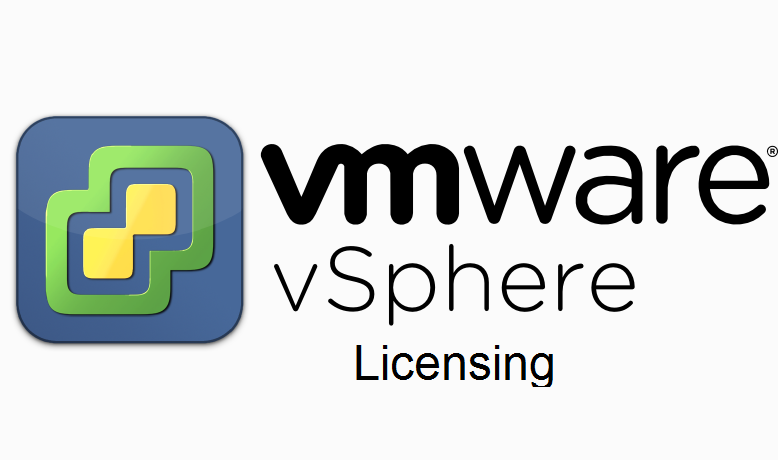 VCSA VAMI (vCenter Appliance Management) can be accessed using port 5480. VCSA Appliance Management is one of the best feature of VCSA. 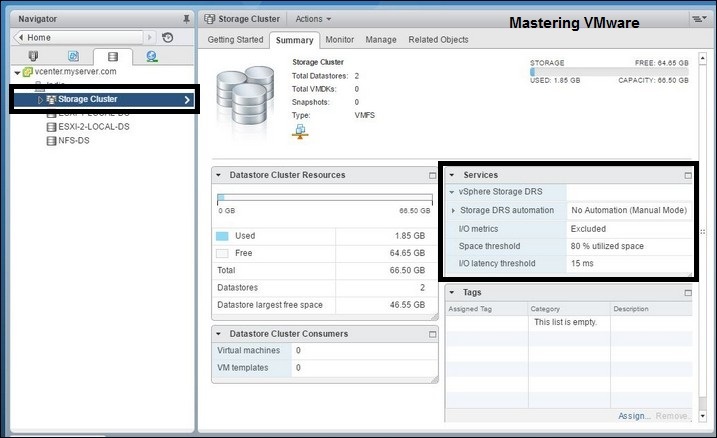 With Appliance Management you can completely manage your vCenter Server Appliance separately. All new UI is called the clarity UI. VCSA Appliance Management provides the detailed view, stats and configuration of the vCenter Server Appliance. 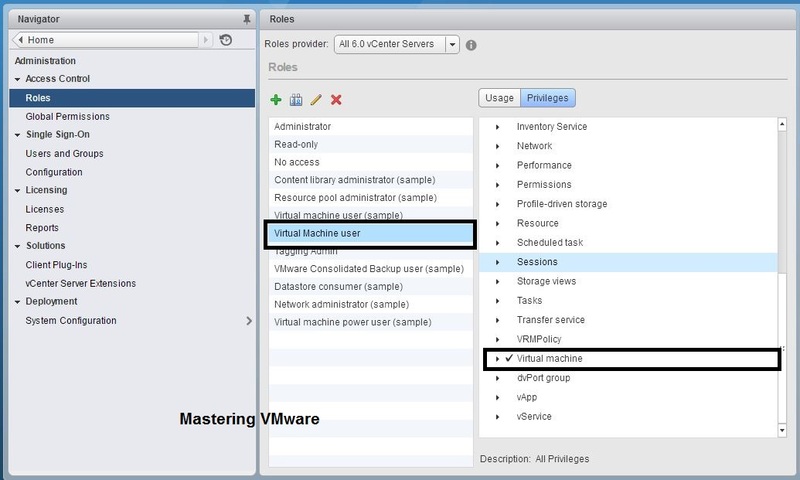 Where you can view the details and utilization of the vCenter Server Appliance and you can configure and manage Networking, Services, Updates , Backup and many more things. VCSA Appliance Management also comes useful when you want to upgrade your vCenter Server Appliance. 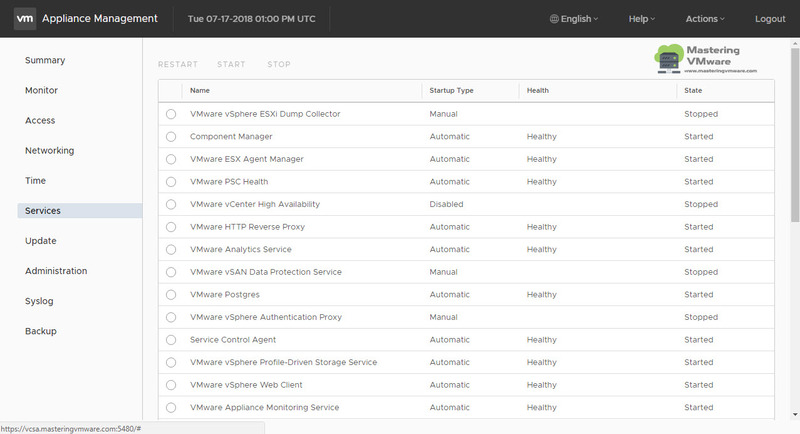 In the new release of vSphere 6.7 VMware has added new monitoring capabilities, Backup scheduler and many improvements in VAMI. In this post we will see overview of the VAMI. So if you are accessing it for the first time you can easily come to know which section is used for what. 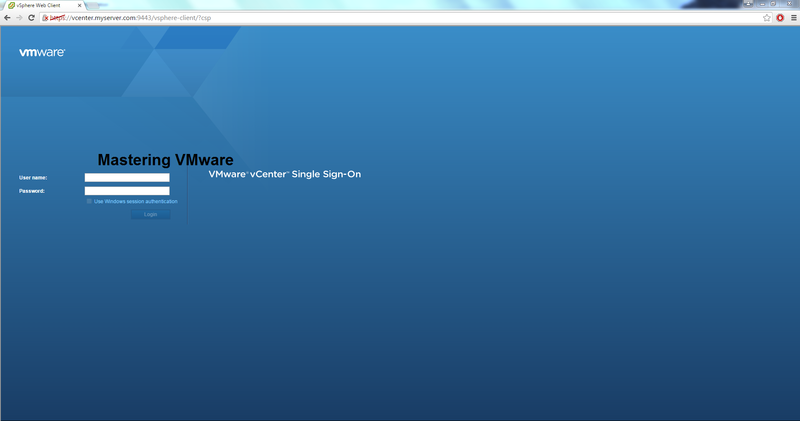 First to access the VAMI enter the vCenter URL with the port no 5480 in the browser. Now the first page you will see is login screen. Login with root account credentials. This is the home page. You can see There are different sections for different options in the Left side bar. 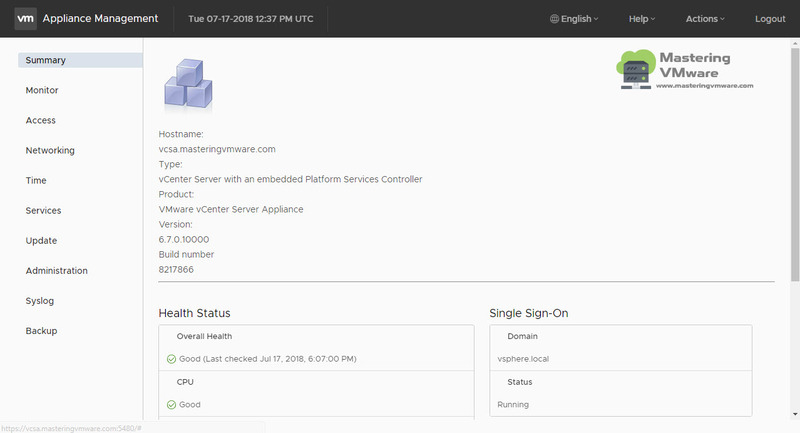 Summary Page provides the vCenter Server Details, vCenter Server Health Status and Single Sign-On details to know about the status of vCenter Server. 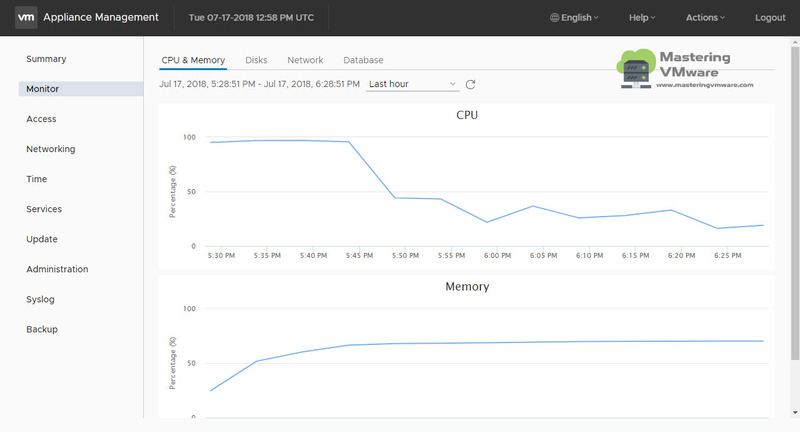 CPU and Memory: It will show you the nice graph of the CPU and Memory Utilization inside vCenter Server. Disks: This is the newly added where you can see the Disks Used space, Available Space and Total Space. Network: It will give you the real time network traffic stats of the vCenter Server Appliance. 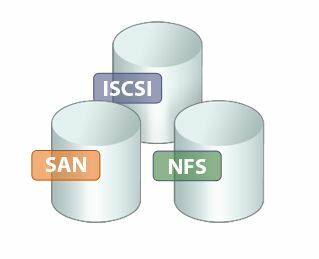 Database: It shows the database utilization and performance of the database in VCSA. It will help you to Enable or Disable access to the vCenter Server using different ways such as SSH, Bash Shell etc. 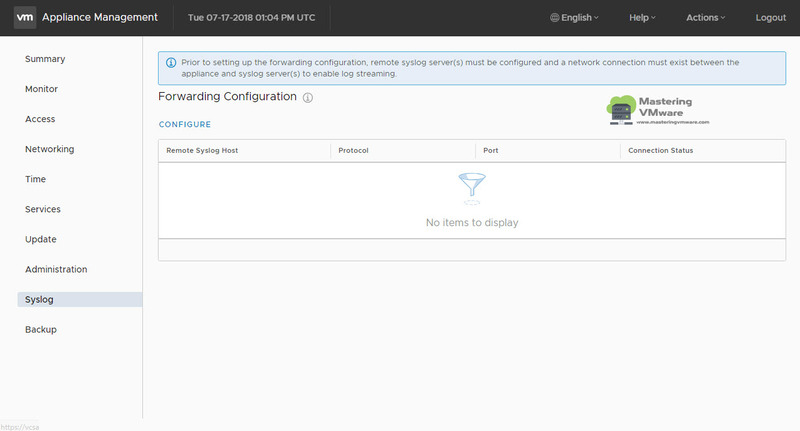 Here you can view and manage the network configuration of vCenter Server. 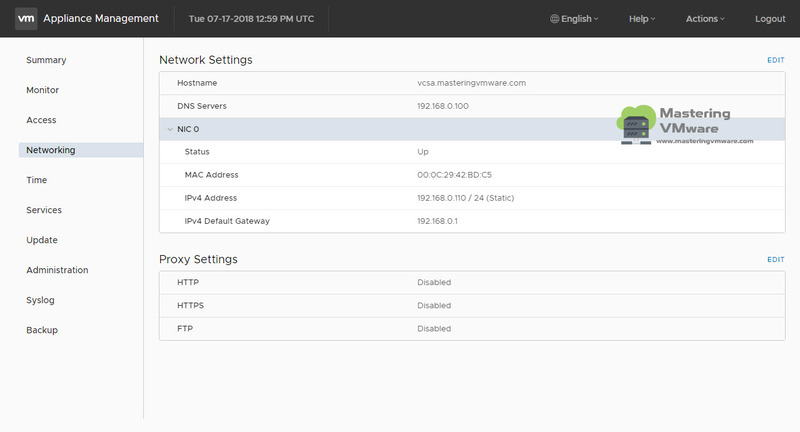 You can also configure Proxy settings. 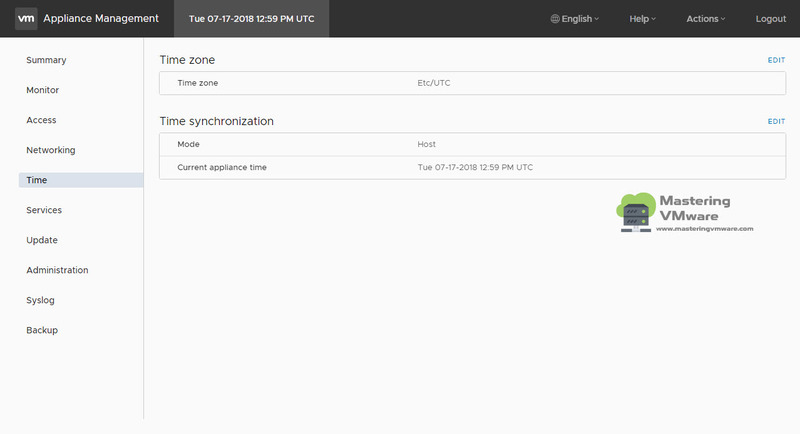 You can configure Time Zone and Time Synchronization for vCenter Server Appliance. Just click on Edit button to change Time Zone and Time Synchronization. 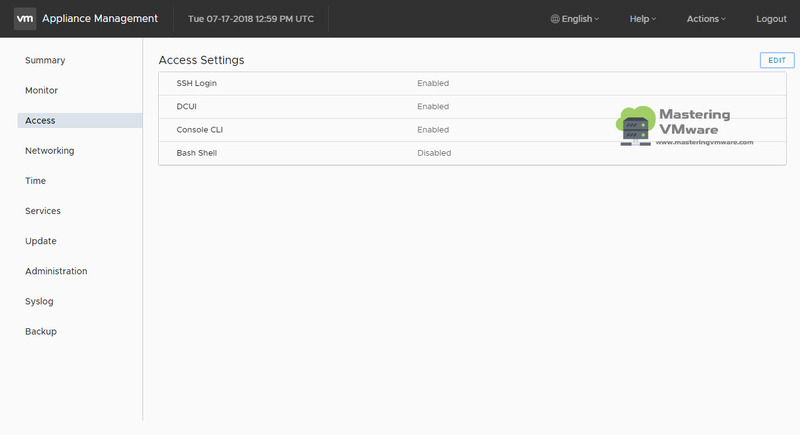 This is most one of the useful feature where you can directly manage all the vCenter Server related services. You can do start, stop and restart any of the service from here. It will also show you the Service Startup type and Health of the services. As name suggests it will help you to check and install updates for vCenter Server Appliance. 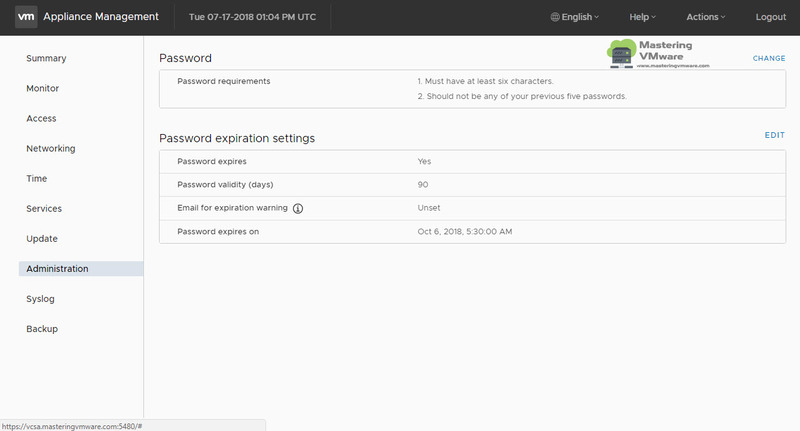 Here you can configure Password Policy and Password Expiration settings for the vCenter Server Appliance. If you have syslog server in your environment, then you can configure and manage syslog server for the log forwarding. 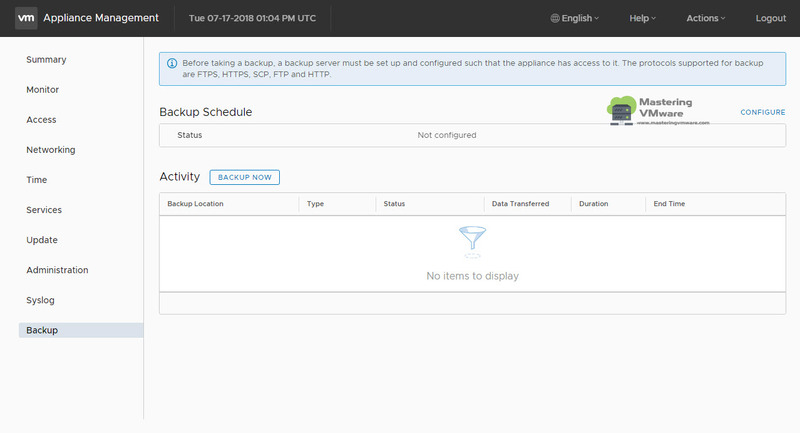 Here you can configure and manage Backup of the vCenter Server Appliance. 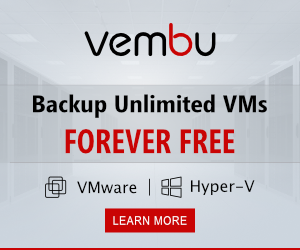 It is an inbuilt function of vCenter Server to take backups. It supports various protocols such as FTPS, HTTPS, HTTP, FTP, SCP. 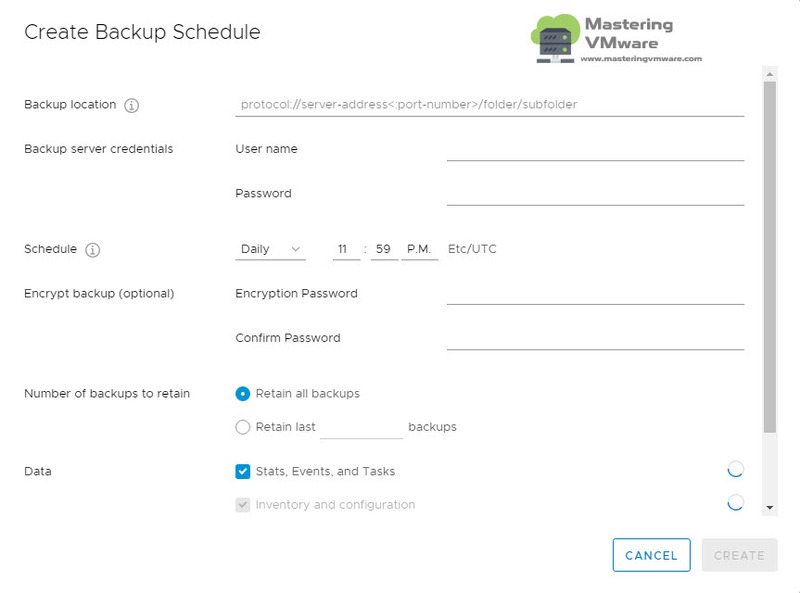 Below is the Backup Configuration Page where you can configure and schedule backup of the vCenter Server Appliance. Using this way you can easily perform various operations using VAMI provided by vCenter Server Appliance. 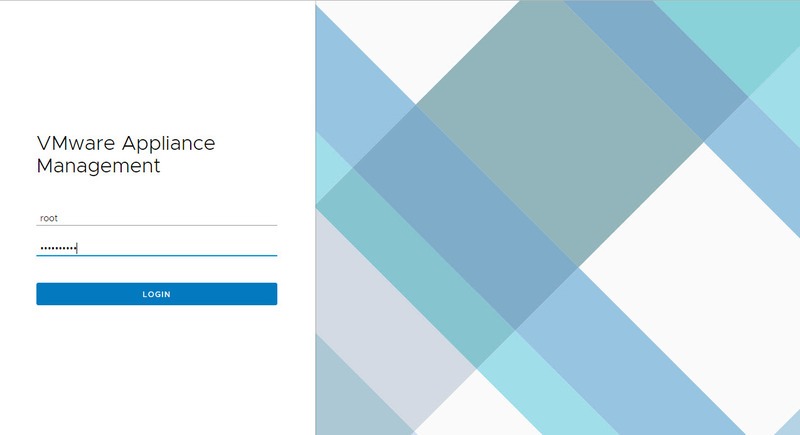 How to create new role in vCenter Access Control ? 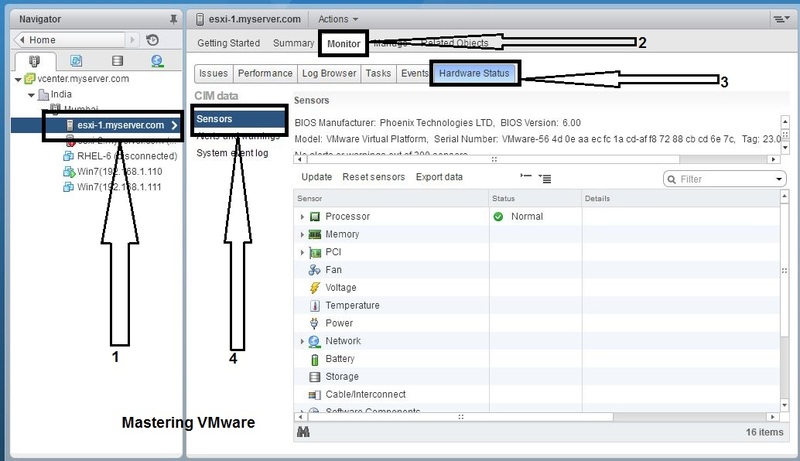 How to View ESXi Host Hardware status ? How to configure Storage DRS ?